According to the Centers for Disease Control and Prevention (CDC), over 11% of American children have an Attention Deficit Disorder (ADD) / Attention Deficit Hyperactivity Disorder (ADHD) diagnosis. While an estimated 30% and 50% of people with Autism are also diagnosed with ADHD, this is a condition that affects the lives of children, adolescents and adults, with or without developmental disabilities -- located in all walks of life. ADD and ADHD is a condition that can be effectively managed with the use of proper strategies. Evidence has shown that by using a proper combination of medication management and behavioral strategies, persons with ADD/ADHD can be given an opportunity to achieve their highest level of functioning. But what constitutes “proper combination?” How do you monitor this? Does this change over time? Like any other condition, early detection and intervention are key to future success. 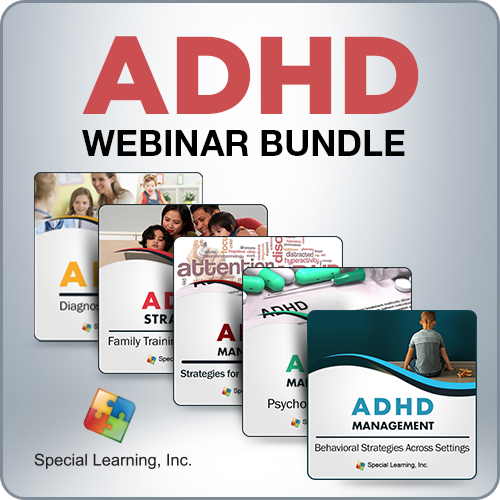 In our ADD/ADHD LIVE Webinar series with Dr. Ronald T. Brown, a renowned ADHD expert, we will demystify the mystery of ADD/ADHD so that parents, teachers, clinicians and other care providers can learn about medication and behavioral strategies to help individuals with ADD/ADHD reach their greatest level of functioning. Each purchase corresponds to 1 user license/access. Only the user assigned to a subscription will be able to participate in the live, receive the recorded version and obtain CEUs from the webinars. Access to the bundle is valid for 6 months starting from date of first live webinar.